This Sunday when friends suggested a culture walk to the old city, I was a bit unsure but thankfully curiosity took the better of me. The tickets arrived by email, which was obvious. However, what was really cool was an advisory for attire, protection against pick-pockets and of course sensibly bottled water. Excited to experience the ‘old world’ from the ‘new’, we took the violet line (metro) for twenty-two minutes flat. A walk for another five minutes got us to gate number two, the exit we needed to take for our destination. The Meena Bazaar, alive with roadside stalls of “jean pant” sellers, one of who was also modelling them, had clothing for all ages, fashion and of course fancy lingerie. As the street progressed towards the grand building the food stalls appeared with delicious smelling liver fry, mouth watering, even in a crowded forty degree celsius street. It is amazing how efficient we are at consuming every square inch of space when required. 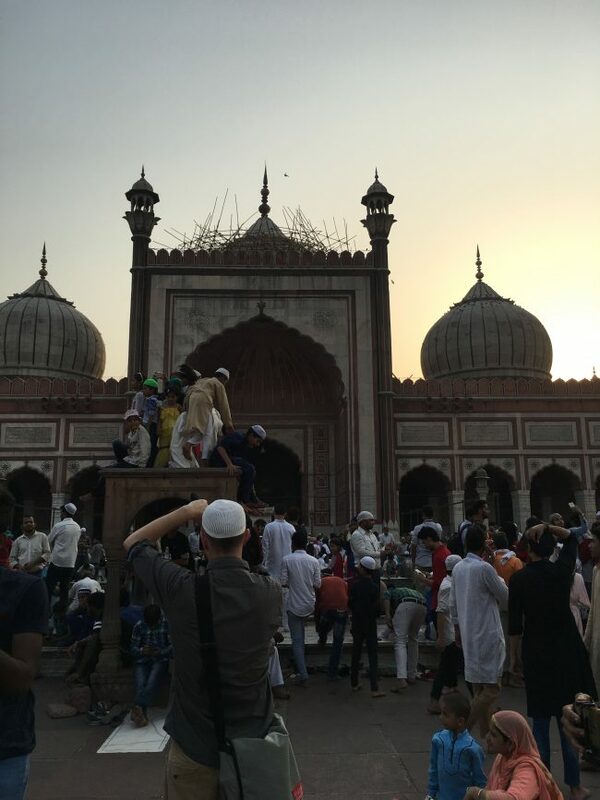 At 6.00 pm, at the appointed rendezvous – the Jama Masjid, we met with the group and our upbeat hosts. One of them was on Roza, the fast that is kept in the month of Ramzan. We quickly marked the space by spreading a sheet and parking our footwear on the side, like everyone else, in the vast and fast decreasing porch. 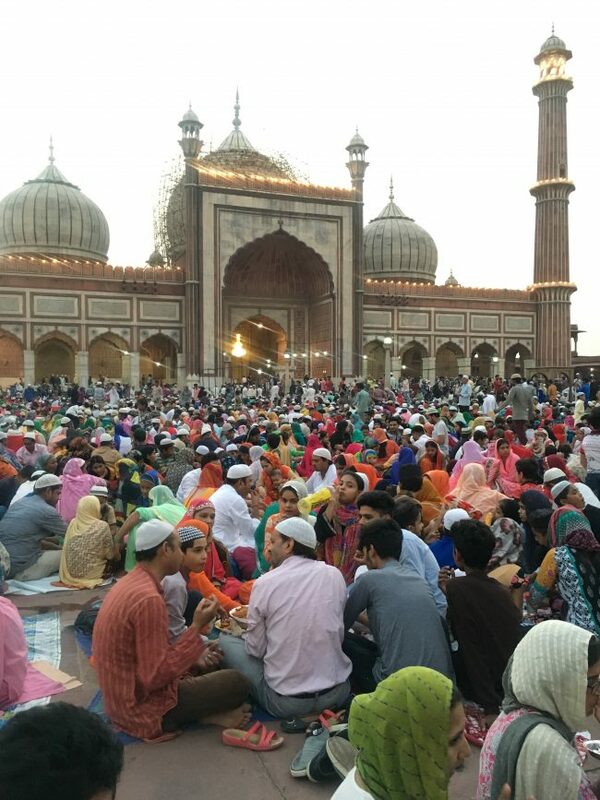 Families had been there since much before, enjoying the nostalgia the Jama Masjid offers, waiting with faith and food for the important moment of the day. This is a special Sunday outing in the otherwise sombre fasting month. Children ran around, playing, climbing terraces, while their mothers & fathers watched peacefully. Some we saying prayers while the young clicked ‘selfie’ shots many times over. Are you watching me or am I watching you? The holy month of Ramzan (aka Ramadan) is special because it is during this period that the holy verse of the Quran was revealed to Prophet Mohammad. It is a period of abstinence and reflection. In today’s fast pace living, this intense fasting practice helps to slow down and re-fresh. Since the Islamic calendar is based on the moon every year the dates move up by ten days. So in a life time one would have experienced the fasting atleast in every season. I have a vivid memory of one Ramzan during my childhood. It fell in the peak summer months and every household made ice for our fasting neighbours! Those were the days of non frost free fridges and poor electricity supplies. The Jama Masjid is a grand building, Salute` Shah Jahan for his vision. The space could really encompass the whole world as its real name suggests – Masjid-e-Jahan Numah. The porch is at a height of 9.1 meter, ie 33 steps, 1200 square meter wide and can accommodate twenty five thousand people. 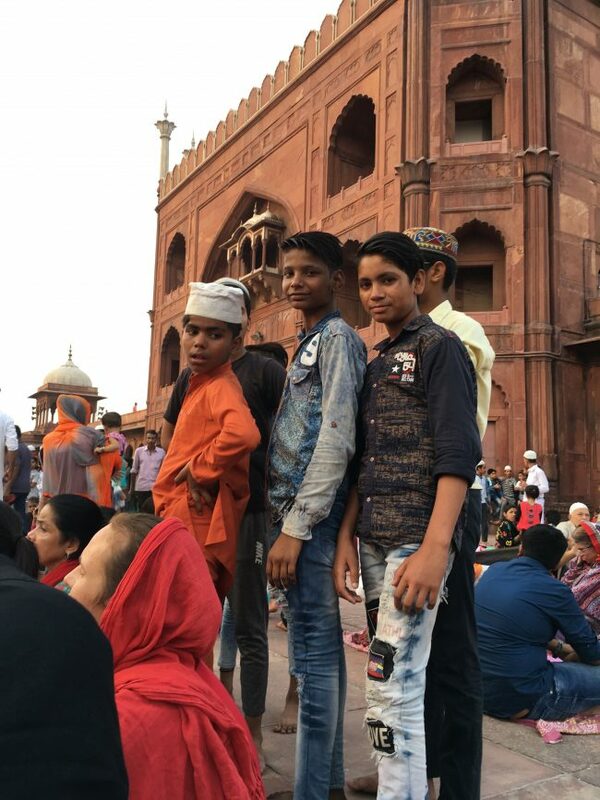 The population of Delhi in 1857 was between one and two hundred thousand approximately while the Jama masjid was completed almost 200 years before that, in 1656. The visionary Shah Jahan built this magnificent structure meant to reflect the world, at a mammoth cost of one million rupees! 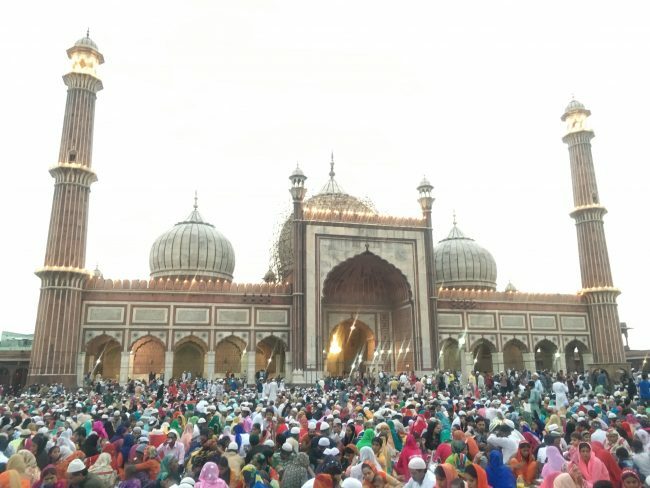 As the sun slowly declined, as the hot red sand stone gradually cooled and as the gorgeous large chandelier inside the Masjid hall was lit, the buzz in the air grew. Foods and drinks came out in plates decorated with dates, fruit, pakoras, kachori and bright green khus sherbet. The faithful waited with patience and the carefree watched. The moment of trance just as the gong rings! Foods being decorated just before Iftar! At the appointed time as the sun set, the gong rang once. There was a strange silence in the atmosphere, and then it rang again and again. This was an intense moment – all energies seemed to focus into one. Before we realized, we were all eating, breaking fast as one. Such a magical moment that is etched in my memory and my being forever. Here we witnessed the primary function of community, when together a collective force is able to impact itself, and in this case positively. We were quick to move out to the next part of our journey to explore Old Delhi. Snaking out through Meena bazaar we reached one of the famous kebab stalls. Soft, succulent and hot out of the fire. It is worth breaking the vegan routine to try these yummies, as I did. The buzz in the street! 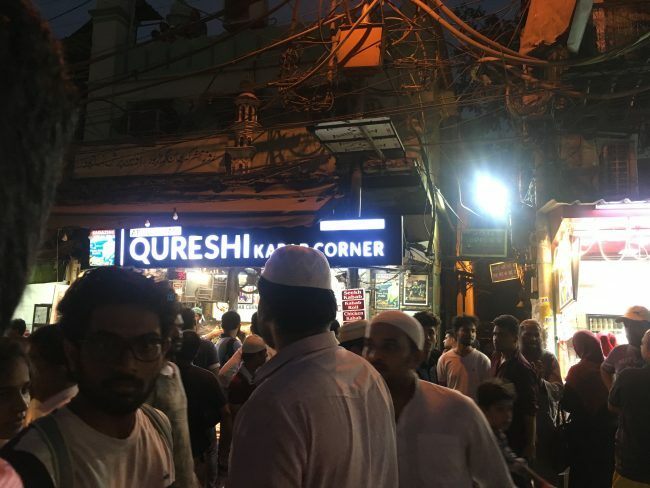 We passed by the famous eateries – Karim, Jawarhar, and a few more. During the month of Ramzan, most eateries start the day at Iftar, ie sun down and continue till late night or even till dawn, ie, Sehri. Sehr means dawn. The shops are small six feet wide by ten feet deep on average, the rents are high, the turn-over even higher, the stories of hard work and success inspiring. The streets are filled with people and motorcycles in a rush. Motorcycles are always in rush in old Delhi while people walk in the correct lane, line up, squat around quite peacefully. Probably, because people fast and motorcycles don’t. Once in a while you come across a crying infant, but more often than not, they are oblivious to the buzz, deep in sleep, in their parent’s arm. The heat is another story – drinking water at regular intervals seems to be the trick. One doesn’t realize till later how dehydrating the heat and crowds can be. The heady concoction of the humid heat, the rush and the delicious aromas, is not for the faint hearted. On the way back home in the metro I definitely felt high, a happy high. 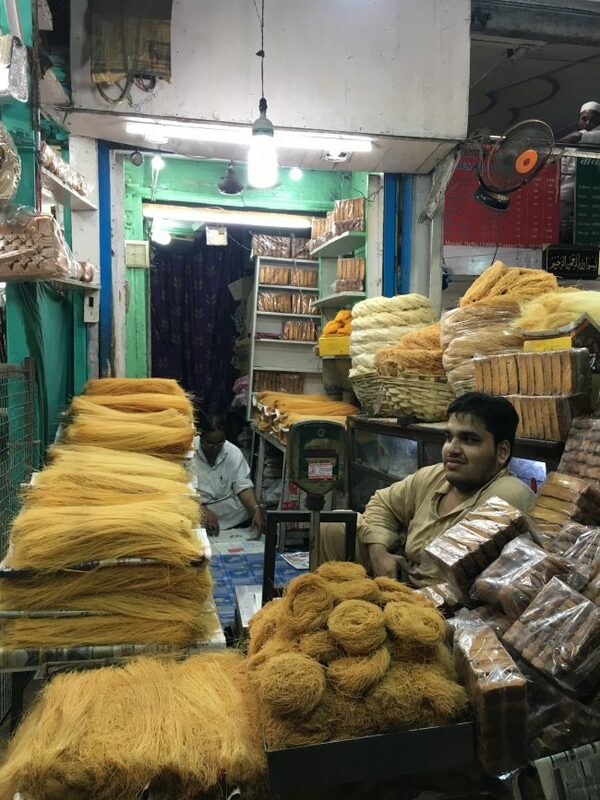 Old Delhi opens up your senses! We had spent three hours already and it seemed to have passed by without notice. 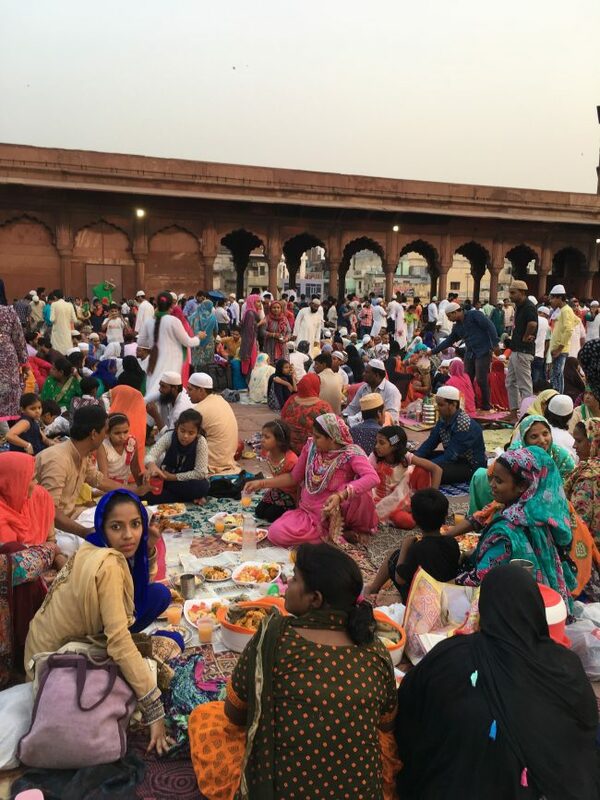 By now we had experienced a profound moment on the high porch of Jama masjid aptly named Masjid – I- Jahan Numah. We also sampled some of the best traditional foods of old Delhi, sweated our livers out and now it was time to say goodbye. The walk continued with lots more to taste and feel. Till my next rendezvous…soak up the experiences and fill your senses. You’ll be happy you took the first step!